Tired of watching your filters pack with sand and dirt after one run? Here's your answer. 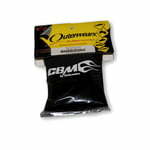 These pre-filters are made here in the USA by Outerwears Performance Products exclusively for CBM Motorsports. They are UV resistant, filter particles down to .005", improve air filter efficiency, extend service intervals, and are completely washable. They are also extremely tough as they are heat resistant to 450 degrees F and are puncture resistant. Does not include the actual air filter. Air Filter Top Measurement (in): 4.75"
Air Filter Bottom Measurement (in): 5.75"
Any conical style air filter with a 4.75" top diameter, a 5.75" base diameter and a length of 9"